But the defender says Champions League glory would make Real Madrid’s season a success. SERGIO RAMOS BELIEVES Barcelona deserved to win La Liga, but is adamant his Real Madrid side are still in good spirits heading into the Champions League final. Zinedine Zidane’s men won 12 games in succession to put the pressure on Barcelona during the Liga run-in, but it was not enough, as the Catalans retained their crown on Saturday following a 3-0 win over Granada. Ramos was disappointed to miss out on the title, but has already set his sights on the European final against Atletico Madrid. “It’s a shame we’ve not been able to win La Liga but we’ll learn from it for next year. The team who makes the fewest mistakes is the one who takes the title,” he told the Madrid website. “We’ve been here until the end and you’ve got to congratulate Barcelona because they are deserving winners of this league. “We’re proud of how the team has put the pressure on Barcelona and had belief until the last moment. It’s easy to have an opinion now, you remember a lot of games and all the points you’ve dropped. The decider of UEFA’s elite club competition takes place on May 28 at San Siro. Email “Ramos: Barcelona are 'deserved winners' of La Liga”. 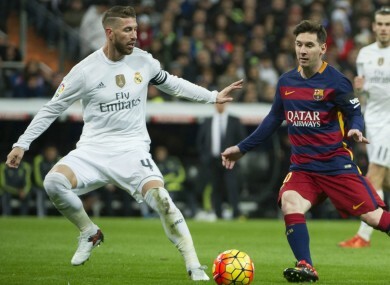 Feedback on “Ramos: Barcelona are 'deserved winners' of La Liga”.